Expanded access to books dramatically improves a child’s ability to learn, succeed in school, and ultimately earn higher wages. We do not accept children being destined to a life of poverty simply because they inhabit a community or a country or a continent that lacks the resources to educate them. 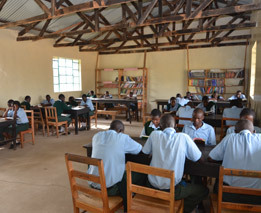 Buildings & Books is dedicated to easing the severe shortage of books that limits educational opportunities and contributes to widespread poverty in Africa. We are also deeply committed to having a positive local impact beyond simply expanding access to books. We maximize community participation by partnering with local stakeholders to guide our decisions; we promote sustainability by providing annual funding to support the operation of our libraries; and we invest in the economy by hiring local workers, utilizing local building materials, and furnishing our libraries with locally built tables, chairs and bookcases. We also believe a strong publishing industry must be part of any long-term solution to improve education and increase literacy in Africa. We therefore support local publishers by procuring locally published books, which is also an added economic benefit, while at the same time ensuring the children who visit our libraries have access to culturally appropriate and relevant books. Buildings & Books is operated entirely by volunteers to allow every dollar we raise to be spent improving the lives of children and the communities in which they live. Geoffrey Plague is Vice President of Public Policy at Independent Sector, and previously served as Advocacy and Policy Director at the Basic Education Coalition, an organization committed to ensuring every child around the world has access to a quality education. Geoff spent nearly 15 years as a senior staff member in the United States Congress, and has taught courses on Congress and foreign policy at Georgetown University and St. Mary’s College of Maryland. His international experience includes leading teams of Habitat for Humanity volunteers in the construction of homes in sub-Saharan Africa, serving on international election observation missions with the OSCE, and participating in official Congressional delegations to more than a dozen countries. Geoff received an MA in International Affairs from American University’s School of International Service and a BA in Political Science from the University of Kansas. Robert Cogorno works for Elmendorf Ryan, a government relations and strategic consulting firm in Washington, DC. Rob previously served more than 20 years as a senior staff member in the United States Congress, including 6 years with current House Democratic Whip Steny Hoyer (MD) and 8 years with former House Democratic Leader Richard Gephardt (MO). Rob received an MA in Public Administration from the University of Washington and a BS in Physiology from the University of California, Berkeley. Jerri Hatch has a deep and sincere passion for the children of Africa. An interior design consultant, Jerri integrates her passion for global art, design, culture and wildlife into her work. Following a 2009 trip to see Rwanda’s Mountain Gorillas, Jerri partnered with Mothering Across Continents to launch the Mentoring Mwiko project at Mwiko School, a public primary school without electricity, water, books or a playground. Through the initiative, a program to combine practical teaching support with creative expression through painting, drama and conservation, Jerri worked to provide the school a native English speaking teacher for an academic year to ease the transition to English as the national language of instruction. The Mentoring Mwiko project also included programs to improve student nutrition, as well as a 20-foot mural, inspired by Mwiko’s students, called “This is Our Dream.” Jerri continues her community to the children of Rwanda by providing financial assistance for students whose families are unable to afford the cost of secondary school. Charles Plague retired after a 32 year career with Hallmark Cards, during which he held a number of senior positions, including National Sales Manager and Regional Vice President. Chuck’s community service leadership has included serving on the Board of Directors of Oconee County (SC) Habitat for Humanity, including 18 months as Board President, as well as serving on the boards of directors of the Salem (SC) Lions Club, the Oconee Medical Center’s Hospital Auxiliary, and the Brooks Center for the Performing Arts at Clemson University. Chuck received a BA in History and Political Science from Rockhurst University. Jon Chessoni has served in the Kenyan Foreign Service for more than 15 years, and most recently served as Counsellor for Administration at the Embassy of Kenya to the United States. Jon was previously posted to the Kenyan Mission to the Republic of Uganda, and has also served at the Foreign Ministry Headquarters in the Department of International Organizations. Prior to joining the Kenyan Foreign Service, Jon was an International Relations Officer at the Kenya Post and Telecommunications Corporation. Jon received a Certificate in Law from the School of Oriental and African Studies at the University of London, an MA in International Relations and African Studies from Ohio University and a BA in French and Political Science from Carthage College. Aoko Midiwo-Odembo is the owner of Legacy Bookshop in Nairobi. Specializing in community and rural development, Legacy Bookshop has for many years been the favored site for launching the UNDP Annual Human Development Report, several World Bank annual reports, and numerous other international development publications. Aoko founded the League of Kenyan Women Voters in 1992, and serves on the Board of Directors (previously as Board Chair) of the Institute of Education in Democracy, an organization that monitors elections throughout Africa. Aoko has worked for a number of nonprofit organizations in Kenya, including the Africa Medical Research Foundation and the Jimmy Carter Center. She also worked at the Centers for Disease Control in the U.S. as a Program Analyst for the International Health Office. She received an MA in Public Administration and Human Resource Development from Clark Atlanta University and a BA in History and Political Science from the University of Nairobi. Rokey Suleman currently serves as an Elections Analyst at the National Democratic Institute for International Affairs (NDI). He was previously the Executive Director of the Washington, DC Board of Elections and Ethics, and before that served as the General Registrar for Fairfax County (VA), and Assistant Director of the Trumbull County (OH) Board of Elections. Rokey is an international elections expert with extensive overseas experience monitoring elections for the Carter Center and the OSCE in countries including Afghanistan, Russia, Egypt, Nepal, Georgia, and Kazakhstan. Rokey received an MA in Public Administration from the University of Akron and a BA in History from Youngstown State University. Matthew Walker currently serves as Vice President, Policy & Public Partnerships Strategy at Teach For America. Previously, he was a professional staff member with the Committee on Education and Labor in the United States House of Representatives, and has held other senior positions in the United States Congress. Matt also served as the Deputy District Attorney in Aspen, CO, and taught elementary school in Los Angeles, CA as a member of Teach For America. Matt received a JD from Cornell University, an Ed.M in Education from Harvard and a BA in Philosophy and Political Science from the University of Southern California. Jude Welling is a Fairfax County (VA) Public Schools teacher, teaching mathematics to ESL high school students whose home countries range from Cambodia and Ghana to El Salvador and Iraq. Jude has served Calvary Women's shelter in Washington, DC as a bi-monthly overnight volunteer. She also provides respite care for families with children with special needs through the Access Breakout program, and works with teens in Arlington YoungLife. Jude has worked domestically and internationally with Habitat for Humanity, including in rural Zambia, and during breaks in the school year she works with children in juvenile prisons, government orphanages, and community homes in El Salvador. Jude received an MA from the Initiatives in Educational Transformation program at George Mason University and a BA in Human Development from Boston College.